George Jerry Polasek, age 91, resident of Tonkawa, Oklahoma passed away at his home on October 24, 2017. A graveside memorial ceremony will be held at 2:00 p.m., Saturday, October 28, 2017 at the Riverview Cemetery in Tonkawa, Oklahoma with Pastor Russell Hughes officiating. Care of Trout Funeral Home of Tonkawa. George Jerry Polasek was born in Yukon, Oklahoma on October 18, 1926 to Klement and Bertha Matula Polasek. George served our country as a Sergeant with the Infantry in Asia during World War II. 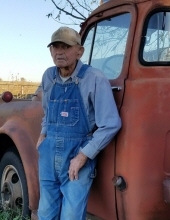 After an honorable discharge, he worked as an equipment operator for the Oklahoma Department of Transportation where he worked until retirement, all the while, growing wheat and other crops on the family acreage and raising cattle. He truly enjoyed farming, ranching, gardening, camping, and playing cards. But, most of all, he loved spending time and working with his family. He took much pride in teaching his children how to handle weapons safely and accurately. George was extremely family oriented and was fiercely devoted to his late wife, Joy, whom he missed so very much. He was a genuinely gentle man who showed great integrity in every aspect of his life. The unconditional love and acceptance exhibited by him touched every person who ever came into contact with him. You have only to observe his family to see the display of the wonderful legacy that follows him. There are not words to explain how much our Papa will be so unbelievably missed; but, those of us who have loved him so----rejoice in knowing that he has now held his precious Joy's face in his hands as she sweetly greeted him. Rejoicing also in the promise that we will all be joined together someday soon, just as the Lord spoke! George is survived by sons Jerry Earl Polasek and wife Susie of Barnsdall, OK, and Charlie Joe Polasek and wife Beckie of Morrison, OK Surviving grandchildren include Sarah Tinnie and husband Jonathan, Evan Polasek and wife Natalie, Mallorie George and husband Damon, Caroline Polasek, and Andrew Polasek and wife Michaella. Surviving great-grandchildren include Maia Marlow, Kenneth Polasek Preston Tinnie, Averie Polasek, Emily Polasek, Madison George and Egan George. He is also survived by one sister, Betty Garrett and husband Don of El Reno, OK.
George was preceded in death by his wife, Joy, daughters Rebecca Polasek and Freda Polasek, grandson George Polasek, brothers Robert, Ted, and sister Berniece. In lieu of flowers, donations may be made to the American Heart Association, PO Box 841125, Dallas, TX 75284-1125. To send flowers or a remembrance gift to the family of George Jerry Polasek, please visit our Tribute Store. Cemetery is located half mile South of Riverview Rd on the East side of S. 108th St.
"Email Address" would like to share the life celebration of George Jerry Polasek. Click on the "link" to go to share a favorite memory or leave a condolence message for the family.